Stolen Art: Should We Ever Let Bygones Be Bygones? A few years ago I dropped in on an antiquities dealer I know from my time working in the auction trade. He’s great company, makes a killer coffee, and always has a new, thrilling, thoroughly engaging yet cringe-inducing story about his latest successful attempt to get his hands on a precious artwork or artefact of questionable provenance. To say that some of the things that have passed through his hands are of museum quality is an understatement. For me, two particularly memorable pieces he showed me that day sum up the reality of the trade in antiquities. One was an exquisite, translucent marble Greek statue – relatively small, but perfect. I can’t be more specific than that because I have no desire to get anyone in trouble. Suffice to say that it was magnificent. It purportedly came to our dealer through the hands of an archaeologist who had excavated it on a small Aegean island and smuggled it out of Greece during the course of an official excavation. The second piece had been spirited illegally out of Iraq, just months after the Allies seized Baghdad. It was an alabaster figurine of such beauty it brought tears to my eyes. As long as we continue to covet precious things and venerate objects of creative human endeavour, the trade in stolen art and artefacts will thrive. But the existence and focus of the trade raises some interesting questions. 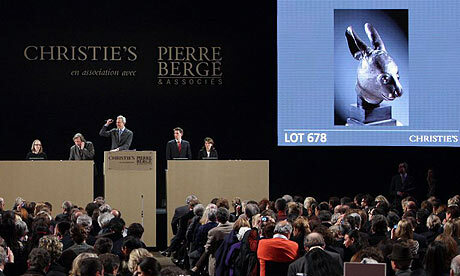 For example: China is threatening auction powerhouse, Christie’s, with “serious” consequences after the auction house refused to halt the sale of two 18th century bronze statues in its recent sale of the late fashion designer Yves Saint Laurent’s art collection (one is pictured above). The sale caused such uproar in China that even martial arts legend Jackie Chan felt compelled to weigh in on the matter. The statues were allegedly stolen in 1860 by British and French troops from the Imperial Summer Palace in Beiing during the Opium War. Given that China is being touted as the new frontier for the art trade, the government’s threat to restrict Christie’s presence in China is a serious one. But the whole situation made me ponder – would the outcome have been different if Christie’s or Sotheby’s had been offered a looted crest taken from the facade of Buckingham Palace, or Abraham’s foot stolen illegally from Lincoln’s Monument? Is this a case of double standards? War loot is nothing new. But that doesn’t make it right. I’m sure there’s plenty of earlier examples, but Nebuchadnezzar and the treasure from Solomon’s Temple is the earliest example I can think of. In recent years, irreplaceable relics from the cradle of western civilisation, Mesopotamia – the land between the two rivers otherwise known as Iraq – have been stolen and spread far and wide. The looting of Iraqi museums has been widely and rightly condemned. Yet on the other hand, the Elgin marbles, stolen from the Parthenon in the early 1800s by the British ambassador to the Ottoman Empire, still retain pride of place in the British Museum. And they’re not going anywhere anytime soon. To put the latter example in context, it would be a bit like if Michelangelo’s Sistine ceiling was ripped out and spirited off to a museum in Beijing. Or if the Eiffel Tower was dismantled, stuck on a container ship and taken away to a cultural centre in Dubai. How would we feel about that? It’s all very well to entertain the idea of universal cultural heritage. Just make sure it cuts both ways.